Preaching for the 14th Proper of Year A with St. David of Wales Episcopal Church. In the name of God: Father, Son and Holy Ghost. Amen. Doubt takes on a distinguished character in Matthew’s account. A verse before this last one says that “When they saw him, they worshiped him; but some doubted.” “If only you had more faith,” the Lord is known to say in this Gospel, “you could move mountains. You wouldn’t be so anxious about your finances.” Yet the haze of uncertainty follows his believers like a pall; and this is thanks in no small part to the Savior of the World himself. 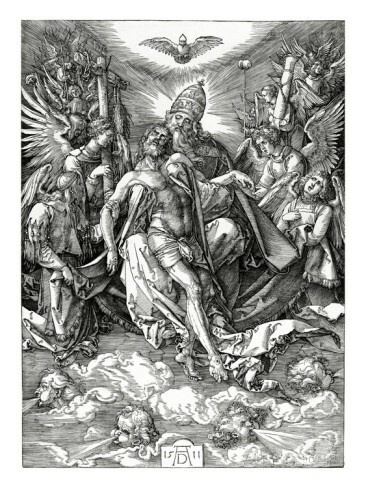 On the cusp of his betrayal into human hands, he also told the disciples, “You won’t know me when you see me next time. You’ll have just given some poor guy a cup of water like it was no big thing and it will have been me- but you won’t even know it till the end of time. Not only this, but a lot of people will claim to be me who aren’t, and a whole lot more will latch onto them for the sake of holding on to anything, while others fall away simply from being disheartened at my lack of presence. Stumbling blocks. False prophets. Cold hearts. If you can make it to the end, you will be saved.” As paranoid as this Jesus sounds to modern ears, he made sense to the community Matthew wrote his Gospel for. They were believers when the world insisted there was nothing to believe in. Most were converts to faith in a man whom they had never met except through the witness of his first disciples, and they were in the midst of being hunted down and killed for it. They are a people whom it is easy to imagine hunched and huddled, straining all together at the oars of some small ship buffeted by the insults of the world, faces wincing at the wind and rain of it’s terrible unkindness. These are a people whose faith comes at the price of mighty doubt, doubt that the world is as it seems, doubt in proclamations of assurance that come too easily, a faith that divides whole families in half. It is little wonder then that the Gospel Matthew leaves us reads here and there as if it were a ghost story: a story of improbable mission haunted by a Jesus who can seem to be, at times, just out of reach. A Jesus who must be shouted after for attention, whose hem must be grabbed for healing; a Jesus from whose table one would even take the crumbs, if she could. There is Jesus, the shifting center of a crowd pressing in upon the object of their newfound faith; and disciples pushing out through to the edges, healing all they can along the way, giving words of comfort as they find them, giving food from strangely never ending baskets under arm. The disciples move, half-way sure that Jesus is just there somewhere behind them: a phantom presence tucked away among the masses who are always pushing further in, always looking over shoulders for the one who sent them. Seas of people by day become a sea at night tortured by the wind. Waves crash upon their meager ship with all the force of a family whose daughter has just died: coming, as they all do, always knocking, always asking for the one whom they have heard can save them. It is little wonder that these disciples see a man walking towards them on the surface of the churning waters, and do not have the faintest clue as to who he might be. Perhaps he is another demon coming to inquire of their Lord. In the life they have been living, it makes more sense to be seeing ghosts at sea than to be approached by the savior at the center of their tumultuous lives. 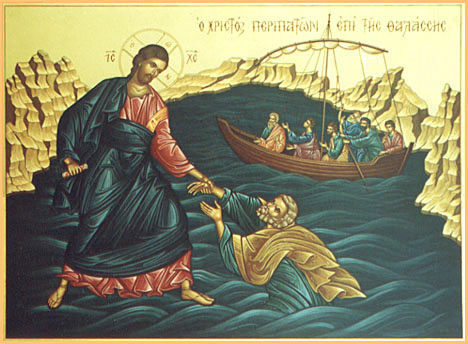 And the man upon the water, for his part, bids Peter in much the same manner as the devil might have bid Jesus, had he accepted his offer of undiluted power in the desert: “Come,” he says. What proof have we come here looking for that we are who we say we are? What proof do you require to know yourselves as children of the living God? Powers beyond belief? Visions of the Lord beyond reproof? Unwavering, steadfast certainty of mind? For as much as this ghost story tells us about all the things which we are not guaranteed on the journey of discipleship, it also tells us exactly what we can expect.